01.09.2016. Old Trafford, Manchester, England. Supersavers County Championship. Lancashire versus Somerset. Somerset all-rounder Peter Trego pulls a ball to the boundary as he and Ryan Davies build a partnership of more than 150 for the 8th Somerset wicket before lunch on the second day. 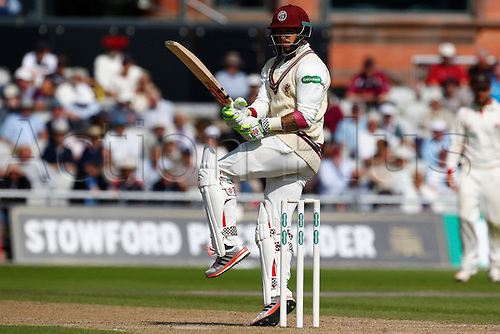 Somerset resumed their first innings at 339-7 at the start of play today.